Shutdown, WOL (Wake On Lan), sleep, restart or hibernate your MAC or PC with one tap! We have developed iShutdown with one goal – to give you functional and stylish tool. To give you an ability to shutdown, Wake On LAN, sleep, restart or hibernate your PC or MAC without leaving your couch or armchair. You will be surprised with the convenience and simplicity of this application. iShutdown scans the devices connected to your local network and shows them along with their name and IP. You do not need to find out the MAC addresses or type them in to use WOL feature. Just tap on host in the generated list and select what do you want to do – shutdown, WOL, sleep, or hibernate it. • Large convenient button to turn the PC or MAC power on/off. 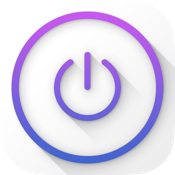 • Turn on (via Wake on lan, WOL), shutdown, restart, hibernate or sleep your PC or MAC. • Ability to add required PC or MAC manually. • The iShutdown Server application (available at http://ishutdownapp.com) must be installed in the PC or MAC to be controlled. • To turn your pc on remotely, the mainboard & lan card of PC must support Wake On Lan (WOL) feature and be activated. Please feel free to contact us with any questions, problems and ideas via e-mail support@ishutdownapp.com.